I am at this point in revisions where I feel like I don’t know what in the hell I’m actually doing. This summer was amazing. I can’t even tell you. I wrote all the time, and by the end of summer I had a real novel, one that for the first time I felt was worthy of revision. Revising Look to the Sky has taught me that I know nothing of the hardships and heartache of revision. Sometimes I feel like I have this whole writing thing figured out, like every change I make is golden, duh. Other times, like right now, I’m hesitant to even open the document because I know that I could be going through this process, making these changes, and it could all be wrong. Seriously. I could end up later taking out all the crap I’m adding in (and I promise, at this point I don’t feel like it’s crap). 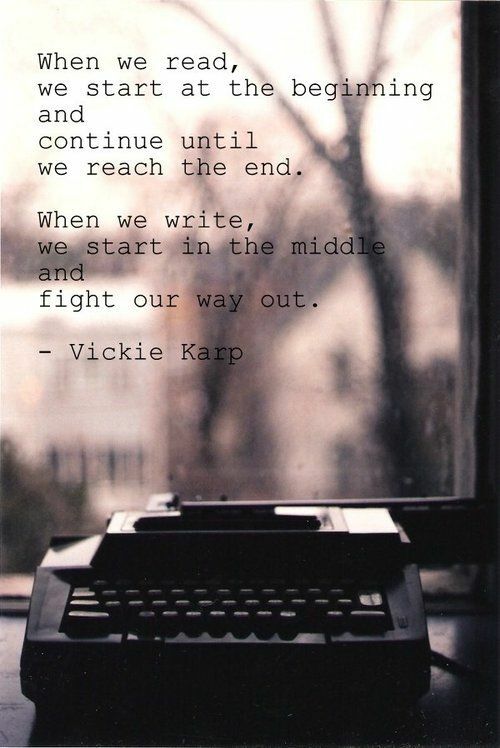 I found this quote in my Pinterest board “The Writing Life” and I’ve decided it fits what I’m feeling exactly. I’m at the fight my way out stage. I’m drowning in ideas to make it better, scenes I need to add, loose ends I need to tie up, and backstory that I need to find a way to build in. All of my minor characters that have in many ways become major characters need to be built up, relationships need to be shown. This fourth or whatever draft sounds like I’m writing the first draft all over again. Don’t worry, though. I’ve always been a fighter. I won’t be giving up on Look to the Sky or Georgia or Joel or Danni or Papa Irvey. Their story will get told. I just need to figure out the best way to do it. Happy Revisions and breaks and day after Christmas shopping to you all!